HeinOnline offers more than 70 million pages of legal history available in an online, fully-searchable, image-based (PDF) format, providing comprehensive coverage of more than 1,500 law and law-related periodicals. 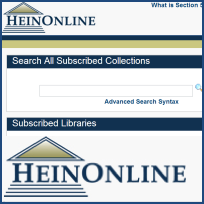 Use this link to search all of the Library's EBSCO subscriptions, including Academic Search Complete, Business Source Complete, CINAHL Plus with Full Text, Computers & Applied Sciences Complete, MEDLINE Complete, and PsycARTICLES. Note: This link only searches EBSCO's own holdings. 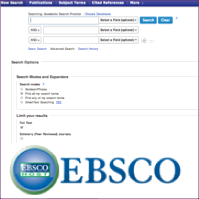 To search EBSCO's materials plus those from ProQuest, Books24x7, and others at the same time, use EBSCO Discovery Service instead. ProQuest Central is the largest single periodical resource available, bringing together complete databases across all major subject areas, including Business, Health and Medical, Language and Literature, Social Sciences, Education, Science and Technology, as well as core titles in the Performing and Visual Arts, History, Religion, Philosophy, and includes thousands of full-text newspapers from around the world. 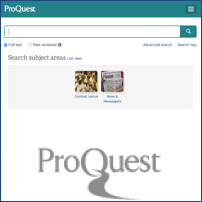 ProQuest Central searches ALL ProQuest databases the Library subscribes to. The below list includes every database Library users have access to, as well as select open access resources, in alphabetical order. Concord Law School students also have access to the full PG Library. Use this page to access its sources and services.